MostCreepy.com - A creepy mystery has occurred on the island of Barbados. 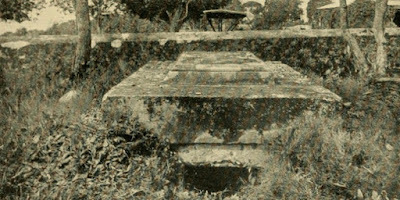 This unsolved mystery is a mystery about a self moving coffin in a family grave. Is the movement of this coffin because of a spirit? Or just because of natural effect? The story of this mystery actually happened about two centuries ago, but the people still trying to solve this mystery till these days. This scary incident had shocked the family of Barbados in the Caribbean islands, the Atlantic Ocean. Even this mysterious incident made the local governor have to deal with this case. In addition, a writer of a famous detective novel, adventure and mystery Sir Arthur Conan Doyle also identifies the mysterious incident of the coffin. It is started from a Christ Church district near the town of Oistins on the southern tip of the Barbados Island. The Walronds family, a prosperous sugar farming family, built a family funeral area. A family member, James Elliot, built the tomb from some stone carvings in such a way that the closing door made of marble. The tomb was so sturdy and nice, that it looked more like a miniature fort. The tomb was marked with the words "His Holiness James Elliot, Esq., Died on May 14, 1724, the son of His Holiness Richard Elliot, Esq. and husband of Elizabeth, daughter of His Holiness Thomas Walronds, Esq. " However, it is not known exactly whether Elliot was indeed buried there, because there were no traces of bodies or coffins. The underground stone tomb was found empty on July 31, 1807, when Mrs. Thomasina Goddard was buried there. But for some reason, a year later (1808), the stone tomb was taken over by the Chase Family, a farmer who owned many slaves. The grave was claimed to be theirs. One of the owners was Colonel Thomas Chase, a garden owner who was known to be cruel to his slaves. The tomb was used to buried Mary Anna Maria Chase, a 2-year-old daughter who died on February 22, 1808. The body was placed in a tin-based coffin. Then the body of Dorcas Chase, Thomas's eldest daughter, was also placed in a tin coffin buried in the cemetery on July 6, 1812. Issues circulated, Dorcas suffered stress, and died by suicide. It was because his cruel father. A month after that, Colonel Thomas Chase died. His body was placed in a wooden coffin. On August 9, 1812 the Chase family immediately prepared the same tomb for the father. But when the door of the tomb was opened, they were shocked. The two coffins of the two girls had changed positions. It was placed horizontally, now it becomes vertical with the head facing down. While around the cemetery area there is no visible traces of forced opening or traces of humans. The two coffins were tidied up again. Thomas Chase's coffin was placed side by side with his daughter's coffins. Then the marble door was closed again. Four years later, on September 25, 1816, the tomb was reopened for the funeral of Master Samuel Brewster Ames, a young member of the Chase family aged 11 months. It turns out that the arrangement of the three caskets in the stone tomb has changed again. Thomas's coffin, which at least had to be lifted by eight adult men, appeared to be leaning against the wall in the tomb. Even so, the coffins were re-arranged as before. The coffin incident at this family tomb surprised everyone. On July 17, 1819, the body of Thomassina Clarke, will be buried in the stone grave. This time many people gathered in front of the tomb area. When the door to the tomb was opened, the incident repeated again. The coffins inside the tomb had moved, in a mess. Bad news spread. That the body of the Chase family was not received by the earth, or about the curse that had befallen the family. Lord Combermere, Governor of Barbados, decided to deal directly with the matter. Because the Barbados region is a very religious area. The issue of supernatural matters is a sensitive issue. When the tomb was opened (in 1819) he carried out an examination and was very surprised when he saw the five caskets look messy, except for the coffin of Mrs. Thomasina Goddard who began to decay. The governor then ordered a number of workers to rearrange the positions of the Chase family coffins. He supervised the work directly, until finally the tomb door was closed again. To convince the entire population, he placed a seal at the door of the tomb. But a number of reports were later received about the noisy and mysterious voices from the stone tomb. On April 18, 1820, he was accompanied by the regional officials of Mayor J Finch, Natahan Lukas, Robert Boucher Clarke, Rowland Cotton, Thomas Orderson, to check the tomb. The seal was not opened, while the arrangement of the crates in the tomb looks messy. A layer of sand that covers the tomb floor leaves no trace. After writing in an official report he then decided to vacate the tomb. This is to eliminate the issue of the spirits, and other issues that are bad for the region. Since then the stone tomb is empty and remains open till this day. For some reason, the Chase family tombstone is one of the most interesting phenomena in the world. A number of tourists who are interested in paranormal activities visiting the location of the tomb. Various attempts to uncover the mystery were carried out. A number of reports and eyewitnesses stated that the tomb was never disturbed at all. Even though there is an assumption that it is possible that black slaves were involved in an attempt to revenge the Chase family, but there is no evidence related with human activity in the tomb. Even when the governor sealed the door, the seal was not damaged at all. If someone insist to go in, surely the seal need to be opened. Other research also explains that there is no possibility of flood activity that allows the transfer of coffins. While if the shift occurs due to the earthquake, there is no evidence of earthquake activity around the place. Because the only thing that changes is inside the stone tomb. This mystery also invited a famous writer with the story of Detective Sherlok Holmes and The Lost World, Sir Arthur Conan Doyle. After visiting the grave site, he suspected that the moving coffins was related to supernatural powers. According to him, the occult power was protesting because the coffins in the tomb were made from metal and tin based. The metal will resist the natural decay process. This theory was proposed by Conan Doyle on the consideration that the Goddard Thomasi coffin which is made by wood was not disturbed at all. Only the Chase family coffins experienced position changes. Many other theories are proposed, but all of them still do not provide satisfactory answers. For more than 180 years, a number of journalists, researchers and writers were interested in the mystery of the stone tomb. Dozens of books discuss the issue ... and the stone tomb is one of the big unsolved mysteries.